Grania Burns had one duty, and that was to protect the wizard Dylan Lightfoot. It was only her loyalty to her king and queen and their directive for her to do this that kept her from the front lines of the battle. Instead, she was expected to baby-sit someone who was creating a spell that would kill her kind. Learning that the cocky wizard was her soul mate was unacceptable. She would simply hold off as long as she could. 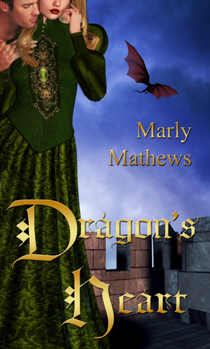 After all, she was a dragon shifter, and even though Dylan was to be her mate for eternity, it didn't mean she liked him. Dragon's Heart was another fascinating paranormal teeming with interesting characters, unique cultures, villains, heroes, and ultimately love. I enjoyed the banter and romance between the hero and heroine. There are also several characters who I would like to see have future stories. And although I thought the beginning had a bit of information overload, I truly enjoyed this story. I am eager to find out where this author will take her readers next.